Thank you for inviting me to discuss our efforts to reduce improper payments each year and our compliance with the Improper Payments Elimination and Recovery Act of 2010 (IPERA), as well as our role in supporting the Treasury’s Do Not Pay Business Center. I am Marianna LaCanfora, Assistant Deputy Commissioner for Retirement and Disability Policy. I am also the Chair of SSA’s Improper Payments Oversight Board. We take our responsibility to reduce improper payments very seriously. As good stewards of our resources and taxpayer funds, we remain focused on the integrity of our programs and minimizing improper payments, which include both paying too much and paying too little. We balance these program integrity responsibilities with our commitment to serve the public and issue timely benefits. In addition, we strongly support the Federal Government’s efforts to reduce improper payments through the Department of Treasury’s Do Not Pay initiative. We administer the Old-Age, Survivors, and Disability Insurance (OASDI) program, commonly referred to as “Social Security.” Social Security is a social insurance program, under which workers earn coverage for retirement, survivors, and disability benefits by working and paying Social Security taxes on their earnings. We also administer the Supplemental Security Income (SSI) program, which provides monthly payments to people with limited income and resources who are aged, blind, or disabled. Adults and children under the age of 18 can receive payments based on disability or blindness. General tax revenues fund the SSI program. Few government agencies touch as many people as we do. Social Security pays monthly benefits to more than 60 million individuals, consisting of 40 million retired workers and 3 million of their spouses and children; 9 million workers with disabilities and 2 million dependents; and 6 million surviving widows and widowers, children, and other dependents of deceased workers. During fiscal year (FY) 2016, we expect to pay more than $906 billion to Social Security beneficiaries. In addition, in FY 2016, we expect to pay about $59 billion in Federal benefits to over 8 million SSI recipients. In carrying out these programs, we are among the most efficient and effective agencies in the Federal Government—our discretionary administrative costs represent about 1.3 percent of benefit payments that we pay under the OASDI and SSI programs. Improving program integrity is one of our top priorities. We have demonstrated throughout the years that we are effective stewards of our program dollars, and have made great strides in minimizing improper payments. We have long used a robust review process to measure the quality of our payments and identify the major causes of payment errors in our programs. This allows us to focus our efforts on the key initiatives that address the root causes of these errors. That same year, we also achieved high levels of payment accuracy in the SSI program despite the inherent complexities (described below) in calculating monthly payments due to beneficiaries’ changes in income, resources, and living arrangements. For FY 2015, 93.9 percent of all SSI benefit dollars we paid were free of overpayment, and over 98.6 percent were free of underpayment. While year-to-year changes are not statistically significant, this overpayment accuracy rate is our highest measured rate since FY 2003, while our underpayment accuracy rate is our highest since FY 2005. I will discuss below what we have done and what we are planning to do to improve SSI program integrity. First, I want to highlight two of our most successful program integrity measures for which we receive special dedicated funding––our continuing disability reviews2 (CDRs) and SSI non-medical redeterminations that save billions of dollars. Medical CDRs are periodic reevaluations to determine if beneficiaries continue to meet the eligibility requirements to qualify for benefits, and SSI redeterminations are periodic reviews of non-medical factors of eligibility, such as income and resources. Please note that changes in benefits that result from CDRs do not necessarily mean that SSA was making improper payments. Rather, these activities ensure that beneficiaries continue to meet the eligibility requirement to receive payments. Dedicated program integrity funding, including the cap adjustment amounts authorized in the Bipartisan Budget Act of 2015, allows us to work down our backlog of CDRs and helps prevent its recurrence over the next 10 years. For our Social Security disability insurance (DI) program, we also conduct work CDRs, which evaluate a beneficiary’s work activity to determine continued eligibility for benefits. In FY 2014, we completed about 250,000 work CDRs for DI beneficiaries. In addition, as required under the Social Security Act, we conduct pre-effectuation reviews of at least half of all initial and reconsideration allowances for DI and SSI adult disability benefits. For every dollar spent in FY 2014 on these reviews, we estimate a lifetime savings of $11 in DI and SSI benefits. Our greatest payment accuracy challenge is the SSI program. SSI is a means-tested program for individuals who are blind, disabled, or aged and have limited income and resources. The SSI program is complex, requiring us to consider many factors every month––including income, resources, and living arrangements––in deciding whether a beneficiary is eligible and how much his or her monthly benefit should be. These factors can and often do change, and improper payments occur when recipients or deemors4 (or representative payees reporting on their behalf) fail to report changes on time in any of these factors, which is one of the biggest causes of payment errors. Furthermore, even if an SSI payment is correct when paid at the beginning of the month, a change that occurs later in the month, even if reported on time, can result in a beneficiary being overpaid or underpaid for that month. For example, a beneficiary who works may receive a bonus or overtime pay during a month, which may result in ineligibility for that month. In other words, the program’s responsiveness to changing circumstances makes it prone to payment errors. Due in large part to these complexities, which are inherent in the design of any means-tested program, the improper payment rate in the SSI program has been consistently higher than that of the OASDI program (where payment accuracy has exceeded 99 percent for many years). 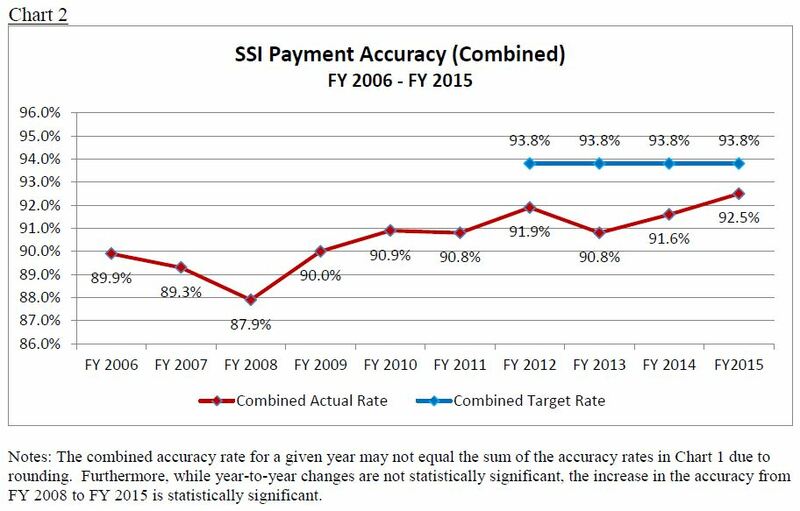 Chart 1 shows the payment accuracy rates for the SSI program for FY 2006 through 2015. Regardless of these challenges, we remain committed to simplifying the SSI program, and we are exploring ways to do this in a fair and equitable manner. Further, as discussed below, we have developed some legislative proposals that would enhance our ability to prevent improper payments in the SSI program. Following OMB’s guidance,5 we established reduction targets for improper payment levels. For FY 2012 through the present, our reduction targets for each year have been ambitious: underpayment error of less than 1.20 percent and overpayment error of less than 5.00 percent — i.e., a combined accuracy rate of 93.8 percent. As Chart 2 shows, this target accuracy rate is considerably higher than the actual accuracy rates for the SSI program over the past ten years. Nevertheless, we selected this rate to demonstrate our commitment to further our strategic goal of reducing improper payments, and we developed a number of strategies (described in the next section) that should, in time and with adequate funding, continue to measurably reduce the improper payment rate for the SSI program. While the accuracy rate in the SSI program generally has increased from FY 2009 to FY 2014, we have not yet met the target of a 93.8 percent accuracy rate. FY 2014 is the third consecutive year for which we reported that the SSI program did not meet the target rate. Accordingly, our OIG determined that the SSI program was noncompliant with IPERA for failing to meet our reduction targets for improper underpayments and overpayments. On June 3, 2016, as required under IPERA, we submitted our remediation plan to Congress (attached);6 some elements of which are described below. • In-Kind Support and Maintenance. Described below are some of our recent efforts to implement initiatives that would address these primary causes of improper payments. For a broader discussion of our current initiatives, see The Social Security Administration's Agency Financial Report (AFR) for Fiscal Year (FY) 2015,7 and our June 3 remediation plan. In the SSI program, when an applicant, recipient, or deemor has financial accounts with values exceeding the allowable resource limits, these accounts may result in periods of SSI ineligibility. Historically, resources in financial accounts that exceed the allowable resource limits are the leading cause of SSI overpayment errors. In FY 2015, over 99 percent of the financial account overpayments were caused by the failure of the beneficiary or his or her representative to report either ownership of an account or an increase in the value of a financial account we already know about. However, we have made strides to combat this cause of improper payments through implementing the Access to Financial Institutions (AFI) program.8 AFI is an automated process through which we verify alleged bank account balances with financial institutions to identify potential excess resources in financial accounts held by SSI applicants, recipients, and deemors. We reduce SSI improper payments resulting from excess resources held in financial institutions by using the AFI electronic process on initial claims and redeterminations (i.e., a review of a recipient’s non-medical eligibility factors such as income and resources to determine continued eligibility and payment amount). In FY 2014, we expanded our use of AFI to cover more SSI initial claims and redeterminations. For the past decade, wage discrepancies have been a leading cause of SSI overpayment and underpayment errors. Wage discrepancies occur when recipients or deemors have actual wages that differ from the wage amount used to calculate the SSI payment. We rely on individuals to self-report wages to us on time, but we know that many fail to report soon enough to prevent an improper payment; our quality reviews have shown that over 98 percent of the wage-related overpayment errors are because a recipient failed to report a change in his or her wages. Over the years, we have implemented initiatives that allow individuals to more timely report wages. For instance, in FY 2008, we implemented SSI telephone wage reporting, which allows recipients, representative payees, and deemors to report prior monthly gross wages via an automated telephone system. In FY 2013, we implemented a similar initiative involving mobile wage reporting through smartphones. In FY 2015, we processed 453,842 successful wage reports through our smartphone wage reporting application and 441,763 through our automated telephone system. These reports are important because we generally receive them in time to prevent improper payments. However, as we recognized that telephone and mobile reporting continued to rely on recipients and others to self-report wage information, we also sought other means to increase our access to timely wage information. Consequently, through the President’s FY 2016 Budget (which was submitted in February 2015), we submitted a legislative proposal to Congress that would allow us to use commercial databases and payroll provider information to verify wages in the SSI program. The proposal would reduce improper payments by authorizing SSA to conduct data matches with private commercial databases and payroll providers, and use that information to automatically increase or decrease benefits accordingly. Congress enacted a provision similar to our proposal in the Bipartisan Budget Act of 2015 (section 824).9 We are excited about this provision as we anticipate that it will allow us to make meaningful reductions in SSI and DI overpayments, and we are working to begin accessing private wage data; we plan to implement in late calendar year 2017. We will issue a Request for Proposal later this year, and we expect to begin using the authority provided under section 824 beginning in the latter half of 2017. SSI ineligibility may result if a recipient owns real property other than his or her principal place of residence (referred to as “non-home real property”), and the equity value exceeds the resource limit. For the five-year period from FY 2011 through FY 2015, our stewardship reviews identified average projected overpayments of $262 million per year resulting from undisclosed real property. We currently rely on the applicant or recipient to report ownership of non-home real property. In 2013 and 2014, we tested the viability of using commercial data providers (e.g., LexisNexis/Accurint) to identify undisclosed real property. In FY 2017, we plan to integrate third-party non-home real property data with SSI systems for use during initial claims and redetermination interviews. We have made enhancing quality and improving payment accuracy one of our critical goals. As I mentioned, I chair SSA’s Improper Payments Oversight Board, which serves as an in-house clearinghouse and oversight body over our many program integrity-related initiatives. We must move away from a model that relies on beneficiaries to report changes that affect benefits to one where we use reliable data to learn about these changes directly. In addition to the initiatives I previously mentioned, SSA also conducts data sharing, which is an effective and efficient method of providing accurate and timely payments. One of our strategic goals is to increase payment accuracy by expanding the use of data exchanges to produce a more efficient and accurate process for obtaining information that may affect benefits. We are constantly looking for and evaluating new sources of reliable data to reduce improper payments while also reducing the burden on beneficiaries to report information to us. In addition, we created and are leading a Federal Data Exchange Community of Practice, with more than 30 Federal departments and agencies, that develops a collective knowledge base; finds common solutions to data exchange challenges; identifies cross-organizational solutions; resolves problems; shares best practices; and builds a network of Federal data exchange partners. We are also looking at efforts across the Federal sector to address improper payments. Late last year, we established an Improper Payment Community of Practice, modeled after the Federal Data Exchange Community of Practice. Our goal was to bring together colleagues, identify common challenges, find opportunities to synchronize our efforts, and establish a forum for learning across government. We held our first meeting in January – and the community has now expanded to include nine Federal benefit-paying agencies. In addition, we have established a new component within SSA – the Analytics Center of Excellence within the Office of the Chief Strategic Officer – to help answer key business questions to determine the effectiveness of our improper payment prevention and reduction efforts. Capturing real-time data and building more meaningful metrics will help us infuse data-driven decision-making throughout our processes, allowing us to focus our efforts on those projects or initiatives that yield the most promise. Our OASDI program has very high payment accuracy. 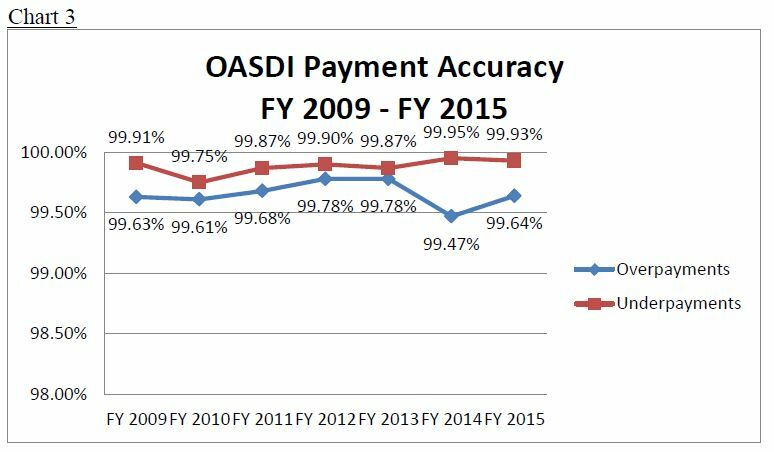 As Chart 3 shows, the overpayment and underpayment accuracy rate for this program, both separately and combined, has been over 99 percent for a number of years. Nevertheless, as with the SSI program, we selected ambitious accuracy rate goals to demonstrate our commitment to further our strategic goal of reducing improper payments. In reviewing our FY 2015 AFR, our IG found us not compliant with improper payment requirements because we did not achieve our target overpayment accuracy rate for FY 2014 of 99.80 percent. Our actual overpayment accuracy rate for that year was 99.47 percent.10 Pursuant to IPERA, in response to the IG's finding, we sent the attached report to the Congress on August 3, 2016. Our quality reviews show that the main causes of OASDI improper payments on average over the last five fiscal years were: (1) DI benefits not correctly adjusted when beneficiaries have earnings above the "substantial gainful activity" (SGA) level, (2) benefits not correctly adjusted when beneficiaries also receive a pension based on earnings that were not covered by Social Security (also known as the "Windfall Elimination Provision" or WEP), and (3) benefits not correctly adjusted when spousal beneficiaries11 also receive a pension based on government service that was not covered by Social Security (also known as the "Government Pension Offset" or GPO). As explained in our report, we continually improve our process to ensure that we timely update beneficiaries' earnings. For example, we recently improved our reviews of beneficiaries' work activity by incorporating information from the National Directory of New Hires. We are also implementing two provisions of the Bipartisan Budget Act of 2015 (Public Law 114-74) that we expect will improve our ability to more timely update our records with information concerning DI beneficiaries' earnings. We are also in the process of implementing a corrective action plan that we developed to mitigate improper payments caused by WEP and GPO. Our plan includes critical training to ensure that staff process WEP and GPO cases consistent with our policies, as well as solutions that address the underlying causes of these errors. These solutions include obtaining new sources of non-covered pension data, improving our automation, and clarifying our policies and instructions. Furthermore, the President's Budget for FY 2017 includes a legislative proposal that would improve administration of the WEP and GPO by providing access to non-covered pension information from the States in the near-term and, in the long-term, modifying the WEP and GPO so the reduction in benefits would be based on the non-covered earnings information we already have in our records. In addition to our efforts to prevent and detect improper payments, we have a comprehensive debt collection program to recover improper payments (and other debts). We collected $3.363 billion in OASDI and SSI benefit overpayments in FY 2015 at an administrative cost of $0.07 for every dollar recovered. We collected $16.6 billion over a five-year period (FY 2011 through FY 2015). We recognize that as our benefit rolls increase and beneficiaries receive cost of living adjustments, our debt balance has grown. Therefore, we see a balanced approach to pursue corrective actions to prevent improper payments and continue to enhance our debt collection program. To recover overpayments, we use internal debt collection techniques (i.e., payment withholding, billing, and follow-up), as well as external collection techniques authorized by the Debt Collection Improvement Act of 1996 for OASDI debts and the Foster Care Independence Act of 1999 for SSI debts. The Department of the Treasury’s Do Not Pay Business Center is an important part of the Administration’s efforts to prevent, reduce, and stop improper payments while protecting citizens' privacy. By using the portal, Federal agencies can carry out a review of available databases with relevant information on eligibility before they release any Federal funds. We collect information from Federal, State, and local entities to provide us with information we need to stop benefits or to change the amount of benefits we pay. For example, we have about 2,300 data exchanges with prisons that allow us to collect the information we need to suspend benefits to prisoners quickly and efficiently.12 We are also working closely with Treasury’s Bureau of Fiscal Service to provide prisoner information to the Internal Revenue Service. In addition, we collect information about deaths to administer our programs. We post about 2.7 million new reports of death each year, and our records are highly accurate. These reports come to us primarily from family members, funeral homes, financial institutions, and States. This information, along with other information that we collect, allows us to stop paying benefits to a deceased beneficiary and establish benefits for survivors. For instance, in FY 2015, we used this death information, along with prisoner information and other data, to stop payments of $640.8 million in the OASDI program. Of note, under current law, we are not authorized to provide the death information we receive from the States to the Do Not Pay Business Center. The FY 2017 President’s Budget includes a legislative proposal that would further protect Federal payments by granting us legal authority to share all our death information, including data from the States, with the Do Not Pay Business Center. Before concluding, let me emphasize that we need adequate, sustained funding to carry out our important program integrity and stewardship, while also ensuring adequate levels of service to beneficiaries and claimants. We are working hard to manage the agency with far less money than we need – our FY 2016 enacted budget was around $350 million less than the President’s request. Consequently, we have been forced to constrain every aspect of the budget including hiring, overtime, and information technology, and we are seeing service degradation in many areas. Service delays are causing hardships for our most vulnerable citizens, who are at an increased risk of both homelessness and disability. Of great concern is the hearings backlog, but we are also dealing with an unprecedented backlog in our program service centers, where we handle a lot of the work that leads to fewer improper payments. That being said, we are greatly concerned about FY 2017, when we will serve a record number of beneficiaries. People are already facing longer wait times for service on our National 800 Number, in our frontline offices, and for decisions on disability hearings. With services already in a fragile state, additional funding constraints in FY 2017 would put our services at greater risk of long-term damage. It is pivotal that we get a funding level that allows us to rebound from this year’s constraints and to improve service to the public. The President’s Budget request of $13.067 billion will do so. The President’s Budget will allow us to increase our program integrity efforts while improving service for the millions of people who depend on us. We appreciate the Subcommittee’s interest in our efforts to maintain high payment accuracy rates and to further our efforts to lower improper payments, especially in the SSI program. 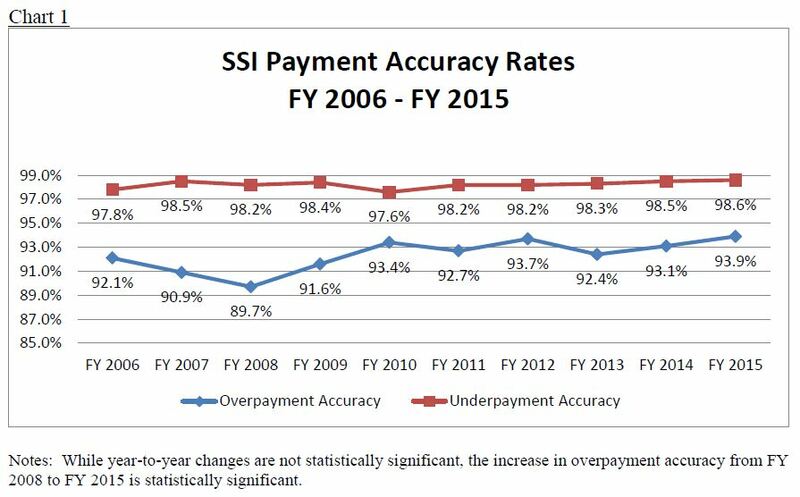 The SSI accuracy rate has been improving over the past couple of years, and FY 2015 saw the highest SSI overpayment accuracy in over a decade. This progress is only possible through adequate and sustained funding. We are working to implement the payroll provider provision in the Bipartisan Budget Act of 2015, and to carry out other initiatives designed to reduce improper payments in the SSI and OASDI programs. Further, we will continue to work with the Congress and the Treasury to support the Do Not Pay Business Center. Thank you for inviting me to testify. I would be happy to answer any questions. 1 For a discussion of the primary reasons for improper payments in the OASDI program, and our efforts to reduce such payments, see The Social Security Administration's Agency Financial Report (AFR) for Fiscal Year (FY) 2015 (pp. 174-177, 184-191), available at https://www.ssa.gov/finance. 2 We conduct medical CDRs on both SSI and DI cases. 3 Using PB 2017 Budget Assumptions. 4 A "deemor" is someone (such as a parent or spouse) whose income and resources we consider in determining an SSI applicant's or recipient's eligibility and payment amount. 5 Office of Management and Budget M-15-02, Appendix C to Circular No. A-123, Requirements for Effective Estimation and Remediation of Improper Payments, Oct. 20, 2014. 6 We also submitted this remediation plan to Chairman Chaffetz of the House Oversight and Government Reform Committee. 7 Available at https://www.ssa.gov/finance (pp. 192-199). 8 The AFI program was made possible by the Foster Care Independence Act of 1999, which contained a provision requiring SSI applicants and recipients to provide their authorization to obtain all financial records from all financial institutions as a condition of SSI eligibility. 9 In enacting section 824, Congress also provided us the authority to use payroll provider information in the DI program. In addition, section 826 of the Bipartisan Budget Act of 2015 required us to develop electronic means through which DI beneficiaries may report wages to us. 10 The attached OASDI remediation plan provides that the overpayment error rate in FY 2014 was .36 percent (i.e., an accuracy rate of 99.64 percent) and the underpayment error rate was .07 percent (i.e., an accuracy rate of 99.93 percent). However, these were the rates for FY 2015. The overpayment accuracy rate for FY 2014 was as provided in the paragraph above, and the underpayment accuracy rate was 99.95 percent (i.e., an error rate of .05 percent). 11 This includes people who receive spouses’ benefits based on the earnings of a living worker, as well as widows and widowers who receive benefits based on the earnings of a deceased worker. 12 We also have a proposal before Congress to adjust the incentive payments that we are allowed to provide to prisons, ensuring that we receive this information in a timely fashion, and thus preventing improper payments.